No more dull toothpicks in the house tonight! Here are some cool and reusable party picks for finger foods and snacks. 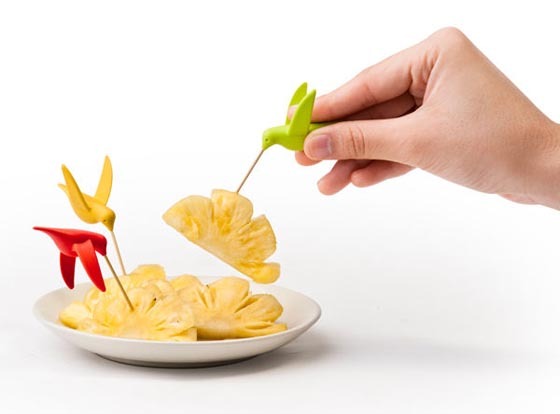 No matter is it cute bird picks or scary zombie picks, these cool and unusual party picks will definitely be an attention-getter on any table and conversation starter. 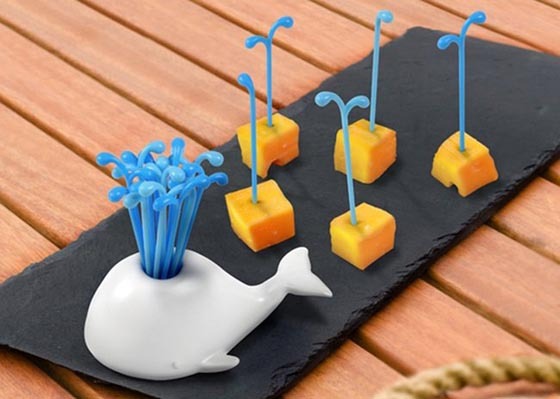 Moby Whale Appetizer Pick set includes a porcelain white whale shaped pick holder with 32 reusable blue plastic spouting picks, great for parties and the holidays. 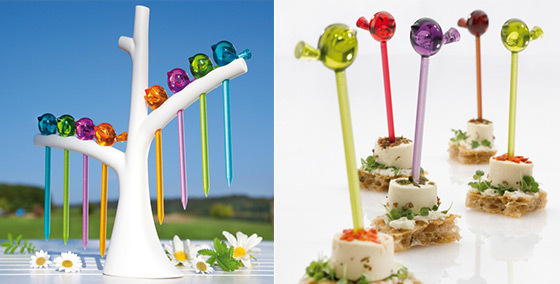 Measuring 2″ long by 1″ high, it’s compact and easy to set among appetizers on a table. Hand wash only. These zombies party picks are prefect for Hallowean. Turn your table into a true zombie apocalypse! With 6 different poses they will appear to be rising from your snacks. Twelve zombies ( 6 green and 6 grays ), all reusable, food-safe, hand wash only. These retro action figures are ready to commandeer your crostini, patrol your portabellas, storm your dessert! They’re rugged and reusable, and they’ll make any guy feel like a kid again. Maybe it’s OK to play with your food, just this once! 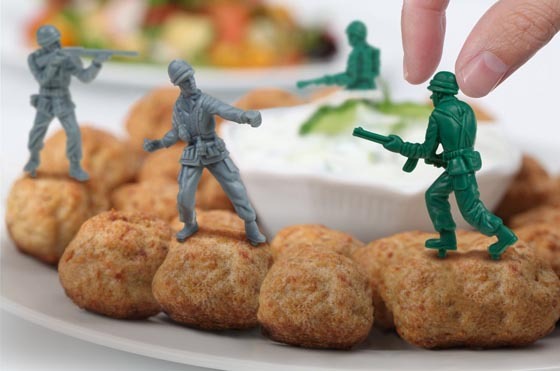 These plastic toy soldiers are three inches tall. Six different poses, 12 soldiers in each pack (6 grays and 6 green meanies). Pi:p is a refreshing new interpretation of the popular party picks and an attention-getter on any buffet. 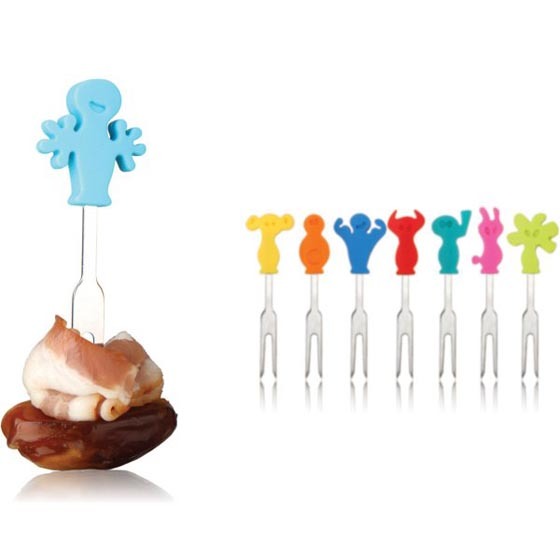 A fun accessory for fingerfood, tapas and everything else that’s begging to be picked up. The popular characters of the Vacu Vin Party People are now available as Snack Markers. 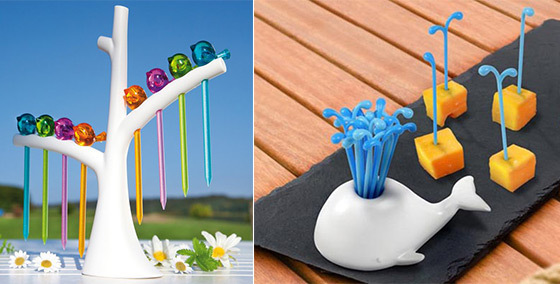 These little forks with fun characters on top are great for parties and family get-togethers. Set contains 8 picks in a box. Not sure who will like it.. this is probably the most unusual party picks I’ve ever seen. These picks look exactly like real galvanized nails pounded into a real block of wood, they are actually completely food safe and held in place by a weighted faux wood foam base. 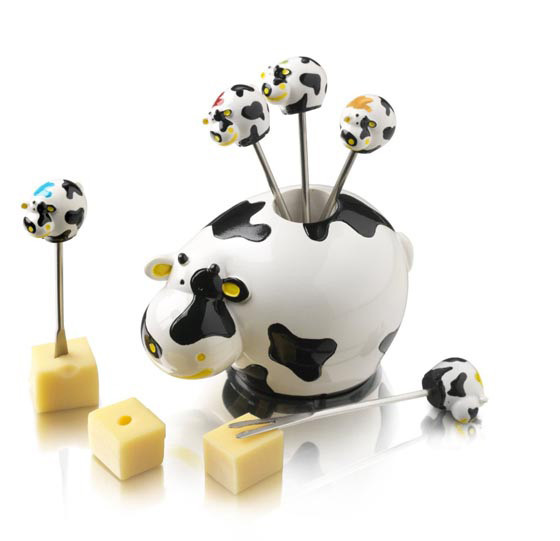 Serve cheese at your next party with this fun Cow Serving Set from Boska Holland. A ceramic cow with six mini cow forks. Help yourself! Let these beautiful hummingbirds fly around your party to create a lively and joyful atmosphere. Includes 6 hummingbirds: black, green, yellow, pink, red and white. This product is made from recyclable polycarbonate plastic, using food grade color.